Greater Birmingham includes Birmingham and Wolverhampton and the large towns of Sutton Coldfield, Dudley, Walsall, West Bromwich, Solihull, Stourbridge and Halesowen, although in reality, Birmingham's employment catchment area is larger than this region and also takes in Coventry, Warwick, the Black Country, Smethwick, Warley and Stratford upon Avon. The Black Country includes Brierley Hill, West Bromwich, Oldbury, Blackheath, Cradley Heath, Old Hill, Bilston, Dudley, Tipton, Wednesbury and parts of Halesowen and Walsall. 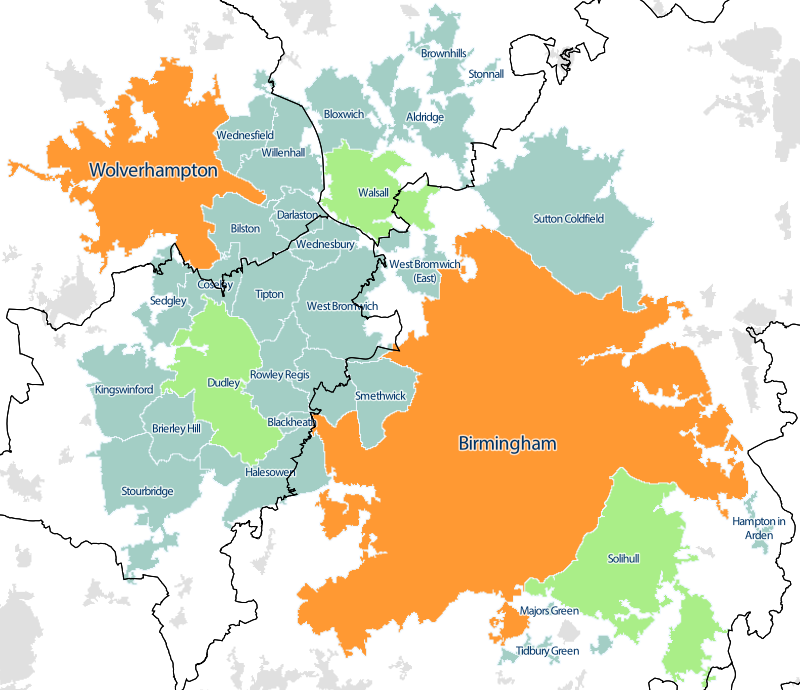 "West Midlands BUA 2011 with TTWA overlay" by Fingerpuppet, created using Office for National Statistics data - Office of National Statistics Geography using the following GIS data:Built-Up Areas (2011)Built-Up Area Subdivisions (2011)Travel to Work Areas (2007). It is not difficult to see that with such a large geographical area any company would not struggle to find suitably qualified employees. As it stands, there are 4.3 million people of working age within an hour’s drive of the city creating one of the largest catchment pools in the UK. Birmingham is accessible from all of these locations by train within 45 minutes, in some cases, well within that time.